A decline in 30 day delinquencies. "Solid indications of fewer new problems coming into the system". Long term delinquencies are a serious problem. 90+ delinquency and foreclosure inventory are both at records. Long term delinquencies are heavily a prime fixed rate loan problem (since prime fixed rate loans are about 2/3 of all mortgages). These are difficult loans to modify, because it is not a payment change issue, but more related to unemployment and loss of income. Brinkmann says foreclosures will stay elevated for some time (several years). Brinkmann says we might see a gradual decline starting in the 2nd half of 2010. In an answer to a question on house prices, Brinkmann noted that 4.5 million homes seriously delinquent or in foreclosure will impact house prices in the short term. Brinkmann expects a steady increase in mortgage rates beginning in April after the Fed's MBS program ends. 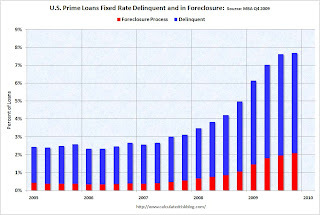 The first graph shows the delinquency and foreclosure rates for all prime loans. 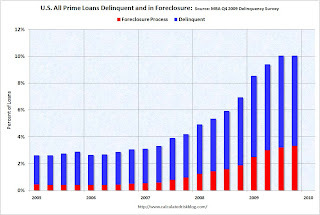 This is a record rate of prime loans in delinquency and foreclosure (tied with Q3 2009). Prime loans account for over 75% of all loans. NOTE: Tanta first wrote this saying in 2007 in response to the 'contained to subprime' statements. The second graph shows just fixed rate prime loans (about 66% of all loans). This is a new record for prime fixed rate loans. Note that even in the best of times (with rapidly rising home prices in 2005), just over 2% of prime FRMs were delinquent or in foreclosure. However the cure rate was much higher back then since a delinquent homeowner could just sell their home. 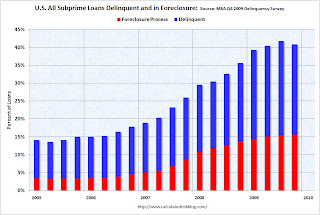 The third graph shows the delinquency and in foreclosure process rates for subprime loans. Although the total has declined, about 40% of subprime loans are still delinquent or in foreclosure. Much was made about the decline in 30 day delinquencies, and this is potentially "good" news. But 1) the level is still very high (3.31%), and 2) a decline happened in Q4 2007 too - and then the rate started rising again, and 3) this is probably related to the slight increase in house prices in many areas.